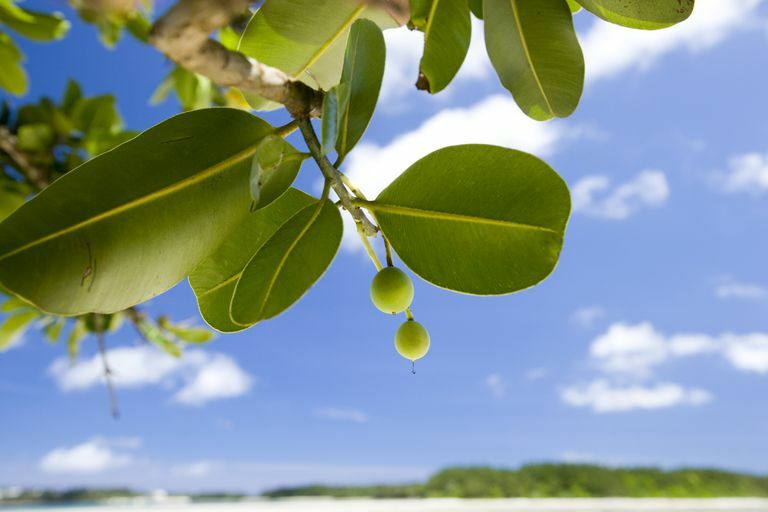 Extracted from the nuts of an evergreen tree called Calophyllum inophyllum, tamanu oil is a remedy long used in Polynesia and Southeast Asia on the face, hair, and skin for conditions such as acne, psoriasis, and scars. Said to reduce inflammation and destroy bacteria, tamanu oil is used topically on the skin and hair. Since tamanu oil is said to alleviate pain, the oil is also used topically to relieve the pain caused by conditions like sciatica, cold sores, and shingles. Some proponents also claim that tamanu oil can help aid in the regeneration of skin. For this reason, tamanu oil is thought to help reduce the appearance of stretch marks and scars like acne scars and keloid scars. In addition, tamanu oil is said to promote the healing of burns, blisters, cuts, and scrapes. Some people also use tamanu oil to soothe insect bites. So far, research on the health effects of tamanu oil is limited. In preliminary studies, researchers have found that tamanu oil contains calophyllolide (a substance known to possess anti-inflammatory properties) and delta-tocotrienol (a form of vitamin E), as well as a number of antioxidants. Tamanu oil has properties that moisturize your skin. Because it is rich in fatty acids, the oil acts as a barrier on the skin, locking moisture in. Tamanu oil is often suggested for scar healing. Although it would make sense that applying an antioxidant-rich oil might help with the inflammatory changes that are part of the wound healing process, there is a lack of research (and even studies on the more established oils, like vitamin E, have had mixed results). Although tamanu oil is generally considered safe when it is used topically, it may trigger allergic reactions in some individuals. If you experience itching, redness, irritation, or other adverse effects when using tamanu oil, stop using the product immediately. People with tree nut allergy should avoid tamanu oil, as the oil is pressed from the nut of the Calophyllum inophyllum tree. If you have a wound, proper wound care can help to reduce scars and prevent infection. Large, deep, or infected wounds should be treated immediately by a healthcare professional. Widely available for purchase online, tamanu oil is sold in many natural-foods stores. Some oil products are 100 percent tamanu oil while others are diluted with different oils such as olive oil. In addition, tamanu oil is used as an ingredient in a variety of personal-care products, including lotions, serums, and moisturizers. Tamanu is found in many creams said to reduce the appearance of stretch marks and scars. Many other natural products may provide benefits similar to the purported effects of tamanu oil. For instance, sea buckthorn oil (a substance that contains essential fatty acids and vitamin E) has been found to promote wound healing and treat eczema when applied topically. Meanwhile, neem oil (also rich in fatty acids, such as oleic acid and linoleic acid) may help treat bacterial infections and protect against insect bites. Natural products commonly touted for their skin-improving benefits also include argan oil, an oil rich in antioxidants and essential fatty acids, rosehip oil, an oil derived from the rosehip plant and often used for scars including acne scars, tea tree oil, coconut oil, emu oil, and DMAE. Oils rich in omega-3 fatty acids taken in supplement form include fish oil, flaxseed oil, cod liver oil, krill oil, and DHA. Other essential fatty acids, such as the gamma-linolenic acids (GLA), borage seed oil, and evening primrose oil, are often recommended. While tamanu oil won't cure any condition, it may help keep your skin and hair moisturized (by locking moisture in) and ease dryness, irritation, and itching. If you have a skin condition or scar, it's a good idea to speak to your primary care provider or dermatologist before using tamanu oil to see if it's right for you. Dweck AC, Meadows T. Tamanu (Calophyllum inophyllum) - the African, Asian, Polynesian and Pacific Panacea. Int J Cosmet Sci. 2002 Dec;24(6):341-8. Crane S, Aurore G, Joseph H, Mouloungui Z, Bourgeois P. Composition of fatty acids triacylglycerols and unsaponifiable matter in Calophyllum calaba L. oil from Guadeloupe. Phytochemistry. 2005 Aug;66(15):1825-31. Tanaydin V, Conings J, Malyar M, van der Hulst R, van der Lei B. The Role of Topical Vitamin E in Scar Management: A Systematic Review. Aesthet Surg J. 2016 Sep;36(8):959-65. What Are the Health Benefits of Jojoba? Can Emu Oil Improve Your Hair, Skin, or Health? Is Ahiflower Oil the New Fish Oil?